Korea, Large Collection in 15 Binders, Few thousand from 1884 to 2017, early issues used, balance mostly mint with later issues n.h., includes lots of souvenir sheets, FDC's, and few commercial covers, generally Fine to Very Fine. Korea, 1895 to 1980 Mint and Used Collection, Housed in binder, earlier issues are used, many souvenir sheets (n.h.) from 1959 onwards, singles are hinged, a useful group, generally Fine to Very Fine. Korea, 1946 to 1999 Mint and Used Collection, hinged on Scott Specialty pages, mixed mint and used to about 1965, then virtually all mint, only a few souvenir sheets, Back-of-Book mixed mint and used, generally Fine to Very Fine. Latvia, Interesting Mint Collection, Many hundreds mostly o.g. including mint #113-117, nice run of Semi-postal and Airmail Semi-postal sets, some perf. and imperf, and some Russian Occupation issues, generally Fine to Very Fine. Libya, Mint Collection, Mostly complete from 1912 to 1941 (missing #61 and some Parcel Post issues) o.g. with a few sets n.h. also includes the French Occupation issues, A great collection of this area generally Fine to Very Fine. Lithuania, Extensive Collection, Many hundreds from 1918 to 1940, mostly mint with some early used, nice run of o.g. 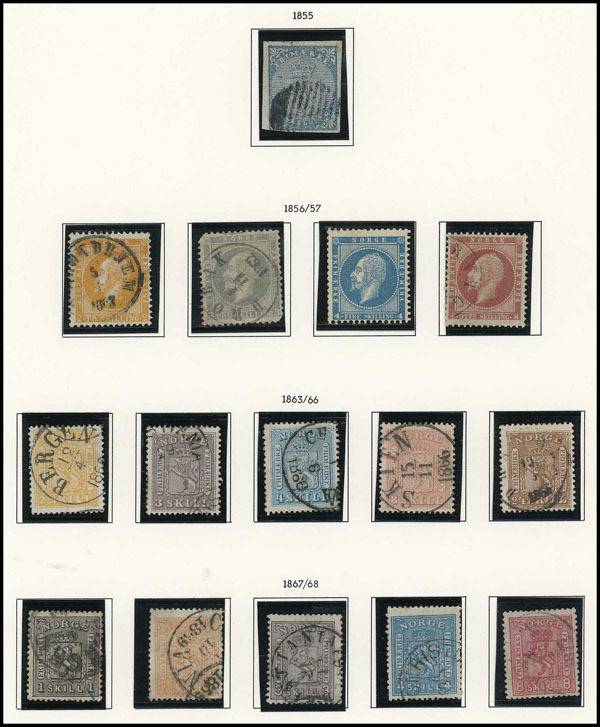 sets, plus a collection of Central Lithuania, generally Fine to Very Fine. Mexico, Intact Collector Collection, Few thousand in 4 Scott albums, 1856 to 2014, early issues used mostly mint from 1944 on with modern issues n.h., some better 19th Century, Airmails and BOB, worth a close look, mostly Fine or better. Mexico, 1856 to 1986 Mint and Used Collection, Hinged and mounted on Minkus pages in a binder, mostly used to about 1945, noted a selection of Officials, generally Fine to Very Fine. Monaco, 1940 to 1994 Mint Collection, hinged on Scott Specialty pages, fairly complete except for early 1940's Semi-postals, a few partially stuck down, Fine to Very Fine. Nepal, Mint Stationery Stock, few hundred mostly Aerogrammes dupl. representing around 15 diff. designs, mostly 1950's to 1960's period, some dupl. with cto cancels, also incl. pack of 100 of Postal Card of 20p values, clean group, inspect. Ex. Friedman "Cover Corner" Stock. Netherlands, Extensive Mint Stationery Stock, 1, 240 singles or sets, mostly early to mid 20th period identified by Michel numbers, priced and sleeved, minor dupl, mostly $2-$10 range clean, total retail $7642. Ex. Friedman "Cover Corner" Stock. Netherlands, Colonies Mint Stationery Stock, 673, mostly classic incl. Peace & Commerce, identified by Higgins & Gage and/or Michel numbers, priced and sleeved, minor dupl, incl. Indies (386-$4, 154), mostly $3-$10 range, clean, taped with retail total $6,818. Ex. Friedman "Cover Corner" Stock. Netherlands, 1852 to 1989 Mint and Used Collection, Hinged and mounted in Minkus album, 19th and early 20th Century mostly used, then fairly comprehensive mint from 1949 onwards, generally Fine to Very Fine. Netherlands, 1852 to 1958 Mostly Used Collection, Hinged on Scott album pages, incl. Semi-postals to 1969, Airs and Dues, generally Fine to Very Fine. Norway, Intact Collection to 2013, in 3 Lighthouse albums in mounts, scattered 19th Century mostly used, 1900 on mostly complete used to 1963, mostly n.h. after that incl. sheetlets, some Officials, 19th Century mixed condition, 20th Century mostly fine to very fine. Norway, Extensive Collection, Few thousand in Scott album from 1855 to 2002, majority used with a scattering of o.g. including Semi-Postal issues, mostly complete (missing #218, etc. ), Fine. Oltre Juba, Complete Mint Collection, o.g., 1925 to 1926, generally Fine to Very Fine. Poland, Collection in 2 Scott Albums, Few thousand from 1860 to 1976, few early used, balance mostly o.g. or n.h. with a few c.t.o. sets, better items include used #1, mint #54, 251, generally Fine to Very Fine. Portugal, 1854 to 1989 Mint and Used Collection, Hinged and mounted on Minkus pages in a binder, 19th and early 20th Century mostly used, then fairly comprehensive mint from 1951, generally Fine to Very Fine. Réunion, 1885 to 1974 Mostly Mint Collection, Hinged on album pages and housed in a binder, fairly good representation throughout incl. Semi-postals, Airs and Dues, generally Fine to Very Fine. Romania, Collection in Scott Album, Few thousand from 1862 to 1968, nice group of early used issues, some o.g. sets and later c.t.o. sets, o.g. Semi-postal and Airmails sets including souvenir sheets, generally Fine to Very Fine. Russia, 9 Mint Sets, n.h., n.h., consisting of #202-206, 573-576, 625-628, 718-720, 767-771 (dist. gum, priced hinged), 817-823, 878-885, 992A-1001, 1277-1279, Fine to Very Fine. Russia, Classic Mint Stationery Stock, 107 units in singles or up to packs of 10, identified by Michel numbers, priced and sleeved, dupl. of Michel #P21 and S1, mostly $10-$40 range, clean, taped with retail total $1,925, 250. Ex. Friedman "Cover Corner" Stock. St. Pierre & Miquelon, 1885 to 1999 Mint Collection, hinged on Scott pages, just a few earlies used, noted many France Libre values, Airmails sparse, a few partially stuck down, generally Fine to Very Fine. Somalia, Mint Collection, Extensive collection from 1903 to 1960, mostly o.g. with some modern n.h. sets, better items include #61-66, 83-96, B38-B51, CB1-CB10, generally Fine to Very Fine. Sweden, Extensive Used Collection, Few thousand from 1855 to 2004, in Scott album, better items include #6-12, 17-27, 197-212, 213-228, B1 (o.g. ), plus nice Back-of-the-Book issues, mostly Fine or better. 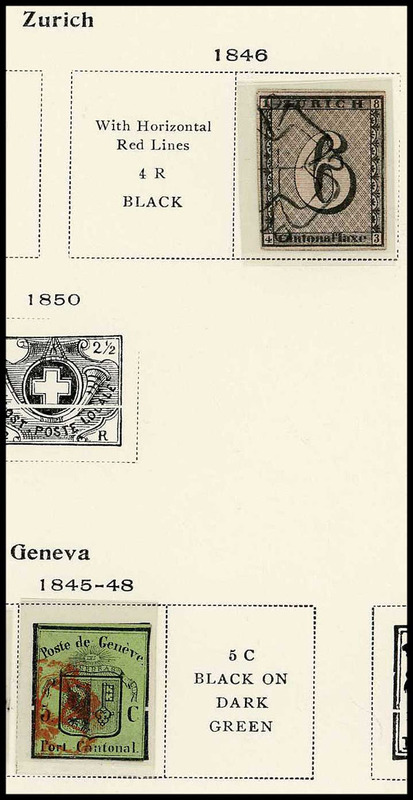 Switzerland, 1845 to 1974 Mint Collection, in Scott specialty album, classics mostly used incl. #1L4, 2L2, #2 with Friedl cert., 5a with Holcombe cert., 1905 basic issues on complete except #105a, and mint (few cheap values used) from #128 on, Semis complete mint (few cheap values used) with better souvenir sheets n.h., Airs complete virtually all mint, some Dues mint or used, better Officials complete either mint or used except #1Ø6, etc., 19th Century mixed condition, 20th Century fine to very fine, cat. value overall higher then noted on pages. Switzerland, 1850 to 2000 Mostly Used Collection, Mounted on Scott albums pages and housed in a binder, light in 19th Century, mint is hinged, Semi-postal issues are included, worth a look, generally Fine to Very Fine. Switzerland, 1850 to 1989 Mint and Used Collection, Hinged and mounted in Minkus album, 19th and early 20th Century is light and mostly used, then fairly comprehensive mint from 1948 onwards, generally Fine to Very Fine. Tannu Tuva, Mint and Used Accumulation, about 500 on Vario pages, some dupl., also incl. is Herm Island and Lundy, Fine to Very Fine. Thailand, 1883 to 1996 Mint and Used Collection, On Scott pages and housed in a binder, mostly used to about 1977, incl. Airs and Semi-Postals, worth a look, generally Fine to Very Fine. 2017 Scott approximately $780+ (Owner's). Tripolitania, Mostly Complete, o.g., missing only CBO1, and EY1, generally Fine to Very Fine.